For the past decade Vizzion Europe has been developing large scale real estate projects across Europe. Through its in-depth market knowledge Vizzion Europe’s developments seek to satisfy the increasingly demanding requirements of its clients and end-users. diversification, both by market and geography. Vizzion Europe is present in the markets of Western Europe, high-growth emerging markets in the Caribbean. Integration of the management-based concept, characterised by exclusive properties offering a range of high-quality services across segments as diverse as hospitality, serviced residences, commercial property, congress centres and restaurants. 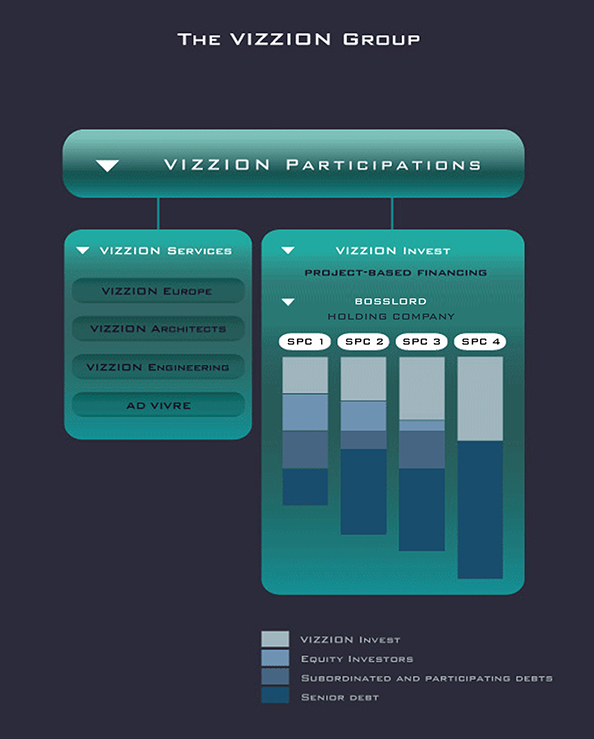 Vizzion Europe is one of the service companies active within the Group that vertically integrates all development competences, spanning the entire process of real estate development: identification and selection of opportunities, programming and technical studies, permitting, execution, management and commercialization. This Group also includes Vizzion Architects, Vizzion Engineering and Art de Vivre. A property investment company Vizzion Invest completes the Group and comprises a range of properties held by separate Special Purpose Vehicles (SPV’s). The Group is headed by a holding company Vizzion Participations, which has been capitalized by private investors and its founder Sefik Birkiye with the aim of securing the expansion of this visionary Group.